Every culture has its traditions about how the world was created. Māori have many of them, but the most important stories are those that tell how darkness became light, nothing became something, earth and sky were separated, and nature evolved. Through the spoken repetition of these stories, the world is constantly being recreated. Like all societies, Māori have traditions about how the world was created. Although various tribes tell different versions of the creation story, there are some themes in common. Most describe movement from Te Kore (nothingness) to something, and from Te Pō (darkness) to Te Ao (light). The separation of earth and sky always features, as does talk of how the gods were responsible for making the natural world. In the beginning Ranginui (the sky) and Papatūānuku (the earth) were joined together, and their children were born between them in darkness. The children decided to separate their parents, to allow light to come into the world. After this, the children became gods of various parts of the natural world. For example, Tāne became the god of the forests and Tangaroa the god of the sea. Different tribes have their own variations of the creation story. In some of these, the god Tāne plays an important role in separating earth and sky. Others talk about a supreme being, called Io. Not all tribes have an Io tradition, and Māori and Pākehā historians have debated whether Io is a pre-European or post-European concept. Often creation is summed up in lists, showing processes in the natural world. For example, the growth of a seed is described in a list that traces the movement from shoot to hair root. These whakapapa (genealogies) emphasise how life is constantly being recreated. 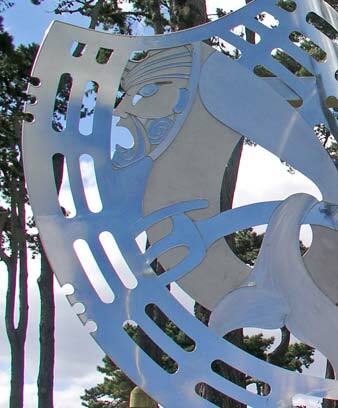 Creation stories have influenced many aspects of the Māori view of the world. The gods who shaped the natural world, for instance, are seen as role models for human behaviour. And the repetition of stories and genealogies is seen as a creative act that mimics the original creation of the world.